Tank does not include CO². It can be filled with CO² at a gas/air supplier. Provides 390 or more shots before needing to be refilled again. The tank can be turned on and off, as needed. 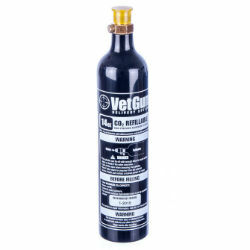 Refillable CO² tank affixes directly to VetGun™ without the need for an adapter.